This load was developed to be used in ALL/ANY 44 SPL firearms including Charter Arms. Our other heavy 44 SPL loads exclude the Charter Arms as suitable for use with them. 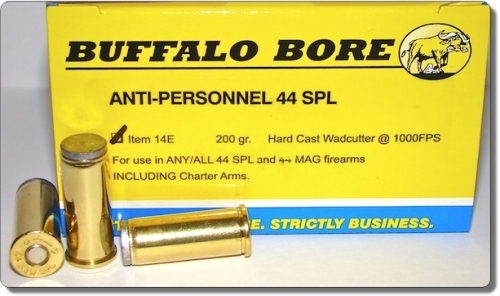 Due to popular request to make a potent defensive load in 44 SPL that can be fired in ALL 44 SPL or 44 MAG. firearms, we’ve developed this hard cast Wadcutter 200gr. load. It utilizes a “low flash” powder as nearly all defensive shooting in the US occur in low light when the criminal element is at work and it would place the shooter in a defenseless position if he or she were blinded by the flash of their own gun fire on the first shot. Expect about 24 inches of straight-line penetration in living mammalian tissue with this load. This load utilizes a hard cast (not soft lead) properly lubed bullet and will not substantially lead foul your barrel, even if you fire hundreds of rounds. This stuff is awesome. Will be buying more! Exceeds expectations. Out of my Charter Arms 44 with a 2.5 barrell it flies at 952 fps that equates to 402 ft/lbs. of energy! Unbelievable! A wee bit hard on reloads speedstrips or speedloaders, but if it takes more than 5 rounds, I'll pull my 38. Low recoil very accurate in my Taurus 3 inch 441 less than 2 inches at 15 yds off hand 5 shot group. Thanks for keeping those of us on the street well armed with the best. This is a brilliant design, a direct copy of the .455 "Manstopper" round from the turn of the 19th into the 20th century. For a large bore revolver I do not believe there is a superior configuration available. For the record, when with the NYPD Firearms and Tactics Unit (as a sgt and later a lt) one of my responsibilities was in Research and Testing.